The Red C poll for Paddy Power also shows a four-point boost for Fine Gael in the last few weeks. It's all good news for Enda Kenny: Fine Gael is on top, he's the most popular party leader, and voters support him in scrapping the Seanad. OVER HALF of likely voters would vote in favour of plans to scrap the Seanad, according to the latest major national opinion poll. The Red C poll commissioned by Paddy Power shows that 52 per cent of respondents plan to vote Yes in the forthcoming referendum on abolishing the upper house of the Oireachtas. 34 per cent of voters are to vote No, while the other 14 per cent are undecided. When those undecided voters are excluded from the sample, the pro-abolition side enjoys a 61-39 lead. Fine Gael voters are among those most likely to scrap the Seanad, with 64 per cent of likely Fine Gael voters saying they are planning to vote Yes when the undecided voters are taken out. 60 per cent of voters for independents or small parties would vote Yes, as would 59 per cent of Sinn Féin voters and 58 per cent of Labour voters. Fianna Fáil voters are the least enthusiastic about a Yes vote, with a 52-48 divide within that party. The poll is published just as the Dáil begins its discussion on the Bill which would lead to a referendum scrapping the Bill. The poll also shows that Fine Gael has grown in popularity in the last three weeks, restoring a comfortable lead at the top of the party preference rankings. If an election were held tomorrow, it would win the support of 30 per cent of voters – 4 points more than the last Red C poll published in the Sunday Business Post at the end of May. Fianna Fáil loses 2 points, falling to 24, while Sinn Féin is unchanged at 16 per cent and Labour drops one point to 10. Independents and others account for 20 per cent, down one point. Enda Kenny is also the country’s most popular party leader, with 41 per cent approval, ahead of Micheál Martin (36 per cent), Gerry Adams (26 per cent) and Eamon Gilmore (23 per cent). Email “52pc of voters would scrap Seanad, according to latest opinion poll”. 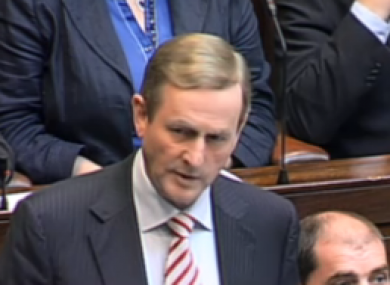 Feedback on “52pc of voters would scrap Seanad, according to latest opinion poll”.